Any youth catcher that wants to improve his game should buy the Samurai Catcher Gear Set from Mizuno. 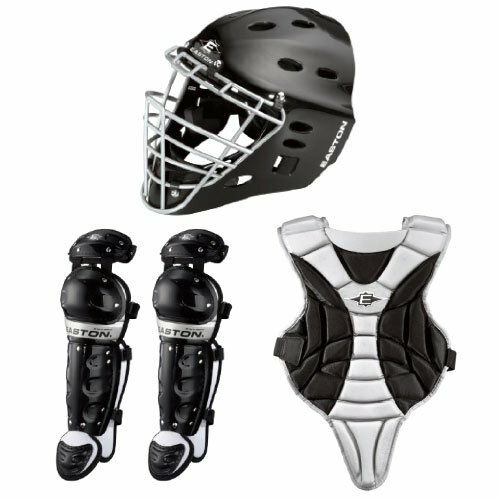 It is a complete set that consists of a helmet, chest protector, and leg guards. The helmet and chest protector have some impressive designs and durable material for impressive performance. 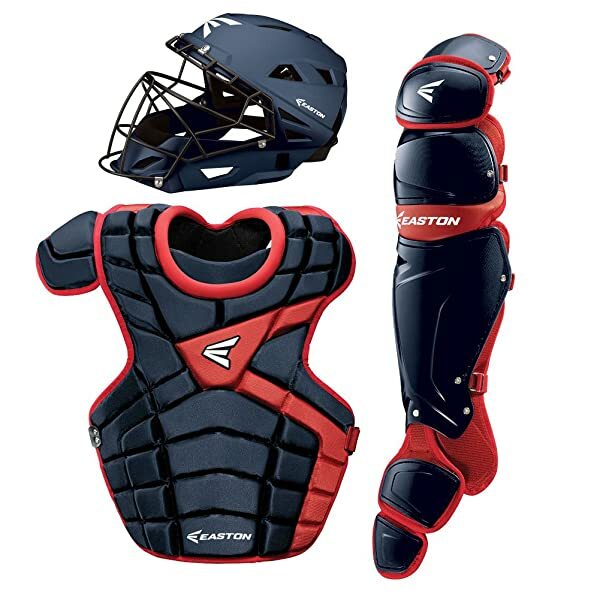 This set comes with a ventilated steel helmet with three layers of form, a chest protector with detachable pads and wings and leg guards with triple knee cup, stainless steel metal buckles, and a DryLite screen. Helmet: The youth helmet in this set has a steel construction that will offer you maximum protection, and it also has a ventilated design for impressive breathability. The helmet has 3-layer padding and a jaw pad that is adjustable for maximum comfort. Chest Protector: The chest protector in this set has a unique design that will give a youth catcher impressive comfort and performance. It has a DryLite inner layer for moisture management, a personalized nameplate and some detachable side wings and pads for a customized fit and protection. 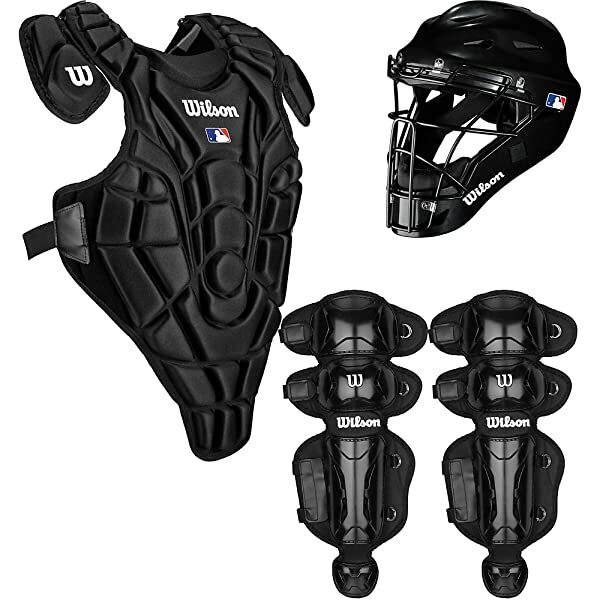 Low Rebound Protection: Low Rebound Tech on the chest protector is one of the most impressive features of this set. This technology deadens the impact of the ball to ensure that wild throws and missed pitches always fall in front of you. Leg Guards: The legs guards have patented and detachable kneepads that will provide you with knee protection and superior fit. These leg guards also have a triple knee cup that is very flexible and some stainless steel metal buckles for maximum durability. Apart from this, there is also some extra protection on the inner shin. Size and Color: Everything in this set comes in a black and gray color combination. The size of the helmet is 6.5 to 7.25 inches, while the guards are 14.5 inches and the chest protector is 14 inches. Everything on the set has a high quality and durable material. It is super adjustable to ensure that it fits different body sizes. The Samurai helmet is of a robust steel construction and ventilated design for breathability. Its helmet also has three foam padding levels for extra comfort. Shin guards are unyielding and durable. Chest protector has some detachable wings for perfect side fit and protection. You also get a stylish bag for the gear. The set does not include a ball and mitt. It is only available in one color combination (black and gray). This set is quite pricey. The bag is an excellent addition, but it hardly fits all the gear. Chest protector might feel a little tight or small for some players. 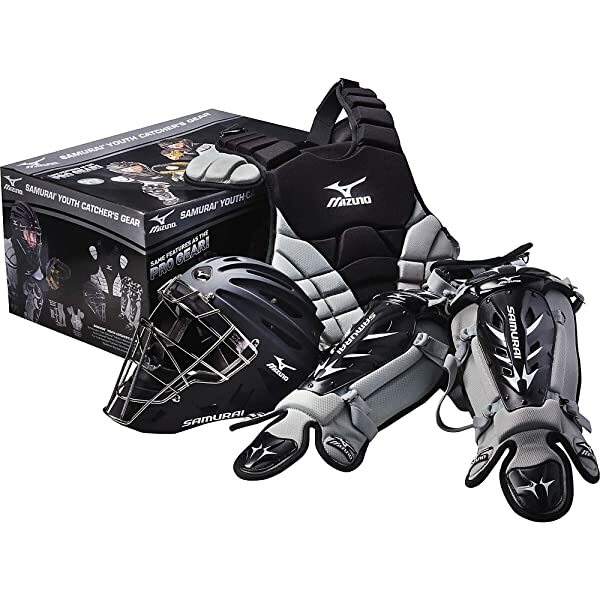 The Mizuno Gear Box Set for youth comes with everything that a young catcher needs to enjoy the beautiful game and to play it safely. 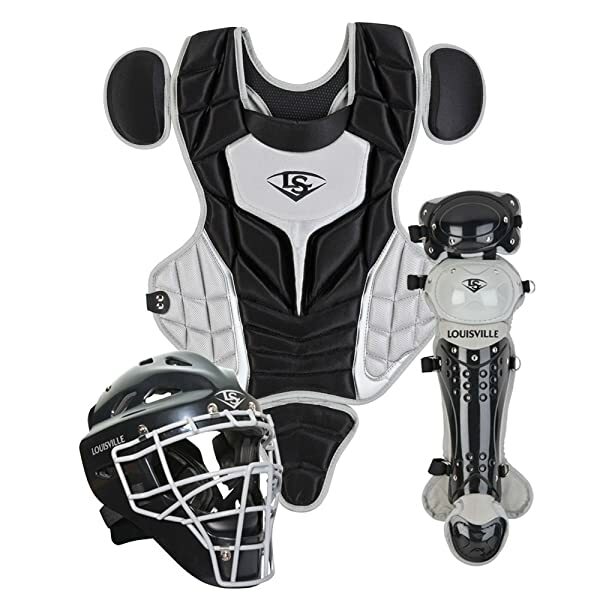 With this gear, you are free to perform to your best level as it offers you excellent protection behind the plate. Everything on this set is top notch quality, and the helmet and chest protector have three layers of foam. The helmet has excellent breathability thanks to the ventilated construction. Apart from this the set also has several other advantages such as the amazing adjustability to ensure that it fits different body sizes. But, there are also a few complaints such as the lack of a mitt and ball or the price tag that some players find expensive. However, any youth catcher that tries this set will find it fantastic and so the bottom line is that it is worth trying out.